Create unique customer experiences for your customers by exploring new possibilities and realizing the full potential of your contact center. Effective project management is essential to the day-to-day planning involved in developing a contact center. Our capabilities are based on an industry best practice governance model to manage deployment, identify primary key stakeholders, and assess your strategic and technology goals. Planning and designing your Contact Center solution require a thorough evaluation of the network and communications infrastructure. The network readiness assessment analyzes the readiness of the existing network infrastructure and provides a detailed report with recommendations. 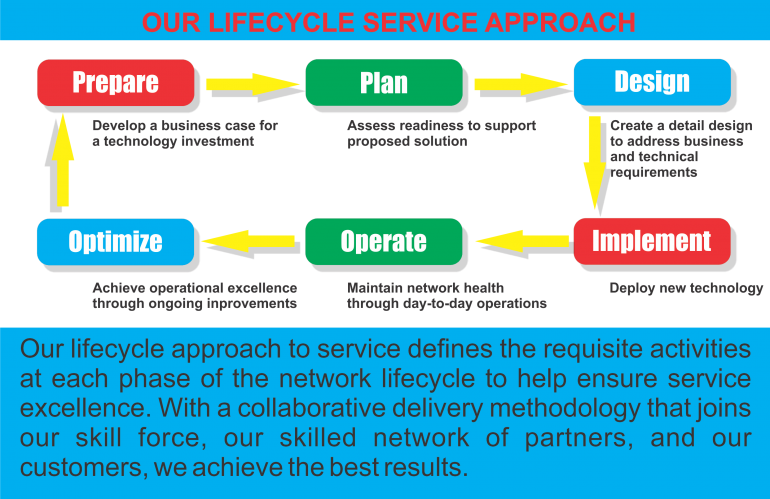 Analysis is done by completion of network discovery and inventory, Network Design Analysis and Network Performance Baseline. Assessing your business processes is an essential component in determining the ability to operate a new contact center solution. This operations support review analyzes the current state of the support infrastructure (including people, processes, and tools) relative to industry-leading processes, gauging readiness to support a Contact Center solution, then makes recommendations for improvement and develops a plan to implement recommendations. Contact Center solution requirements validation process outlines an existing or proposed contact center network, voice applications, and voice and data network infrastructure and verifies the network’s ability to support the new solution. It validates deliverables including the high-level design, bill of materials, and customer requirements, and identifies feature and functionality issues, and it assesses risk a solution might present to the network traffic, databases, or other applications. If necessary, recommendations are provided to mitigate risk. – Document and validate business rules, existing contact center configuration, and feature/functionality issues. Contact Center detailed design development provides a comprehensive, implementation-ready detailed design. The extensive, site-specific design considers call flow and scripting requirements and defines low-level activities (including design of contact center applications, voice and data network infrastructure, and database infrastructure). It provides plans for staging, migration, and implementation and establishes the steps necessary to achieve a successful controlled deployment. Contact Center applications design and development produce and document the call flows, scripts, and in-depth details of specified applications. The design can include computer telephony integration, interactive voice response, multimedia applications, Contact Center reports, and associated databases, as determined during the development of the detailed design. Systems acceptance test plan development creates a series of documented procedures with expected outcomes that validates the new solution against documented requirements. It includes developing and designing a test plan for the Contact Center system and its associated applications. Contact Center performance acceptance test plan development creates a test plan to simulate real-world traffic on the Contact Center solution. Activities include defining performance load test plan needed to measure end user’s experience when accessing applications for voice self-service, speech recognition, intelligent routing, agent desktop, and telephony. The test plan can be designed to focus on a single component, such as Customer Voice Portal, or can validate the entire customer and agent experience. Maximize your contact center customer interactions with services that accelerate your technology innovations and competitive advantage. Design an adaptable platform that engages your entire organization in quality customer support, removing artificial barriers between you and your customers. Tap into our expertise, based on proven methodologies, tools, and talent, to assure operational readiness from the onset, and enables you to achieve self-sufficiency at your own pace.